When you suddenly become responsible for more money than you've ever been responsible for before in your life. 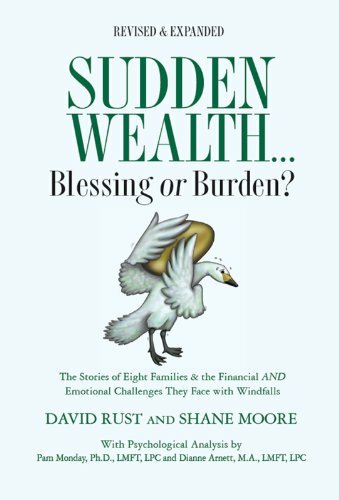 Whether through inheritance, sale of a company, leasing your land to an oil drilling company, death in the family, divorce...whatever the event, it might surprise you to know that the overwhelming response to sudden wealth is a feeling of fear! And for a good reason as any life changing event has enormous psychological and emotional ramifications. This book gives you real life stories to help you understand the impact of sudden wealth on yourself, your spouse, your family and your life. You will have a roadmap for managing the journey both from a logical and emotional perspective. And regardless of your financial status (wealthy or not), the detailed information and worksheets for gathering all of your vital information in one place is invaluable.